Daisy the Dinosaur is a free iPad app designed to introduce young students to some programming basics. 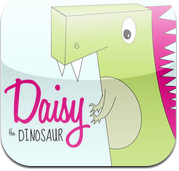 The app asks students to create commands for Daisy the Dinosaur to carry out. There is a free play mode in which students can make Daisy do whatever they want. But to get started you might want to have students work through the beginner challenges mode. Daisy the Dinosaur reminded me a bit of Google's Blockly demos in that students have to enter commands in the correct sequence in order to make Daisy complete tasks correctly. I learned about Daisy the Dinosaur from Terri Eichholz who wrote about using it with her nine year old daughter. I agree with Terri's assessment that Daisy the Dinosaur could be used with students as young as Kindergarten age. For older students Terri recommended another app, but you'll have to read her post to find out about that one (yes, that's a blatant tease for another person's awesome blog).